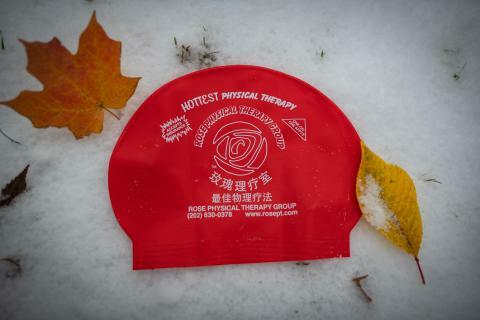 Possibly the hottest physical therapy swim caps ever! This cap's Chinese calligraphy recites something like, "the best phyiscal medicine in the world"...at least that's what we are told by our translators. The same logo is printed on both sides. These caps are high visibility red so you can show off your spicy personality at Wilson Pool, open water swims out at Lake Anna, or protect your hair while remaining easily visible during one of those champaign spray celebrations that you always see sports teams do. Your appreciation for hotness will not go unnoticed. *Must be purchased in person at a Rose location.